Corcoran Expositions, Inc. is celebrating 25 years as one of the country’s premier independent trade show organizers. In total, our experienced Corcoran team has produced more than 700 trade shows in 100 cities—that’s a lot of miles! As part of our 25th anniversary, we debuted a brand redesign, complete with new logo and website, that better matches the efficiencies we have developed in the exhibit marketing and sales process over the years, all to the benefit of our clients. In 2014, Corcoran generated $35 million in exhibit sales, with an impressive 7,000 companies purchasing more than 1.1 million square feet of exhibit space at client shows ranging in focus from beer to brain surgery. Of these exhibiting companies, 3,000 were new to their respective shows, increasing client revenue and energizing trade show floors with the new products & services they represented. Our new look reflects the energy and fresh perspective of our team that has successfully compelled thousands of companies to exhibit at our clients’ trade shows. Our business is built on down to earth, personal connections that lead to long-term relationships. Our approach has produced a history of outstanding client satisfaction, with an average client tenure of ten years. Our first client, the National Beer Wholesalers Association trade show, has been one of our valued partners for all 25 years of our existence. We are grateful to all of our clients who have partnered with us since 1990, and look forward to the next 25 years with a fresh face! 1981 National Restaurant Association, Country Western Night. In the early years of Corcoran, Tom's office doubled as the mailroom. 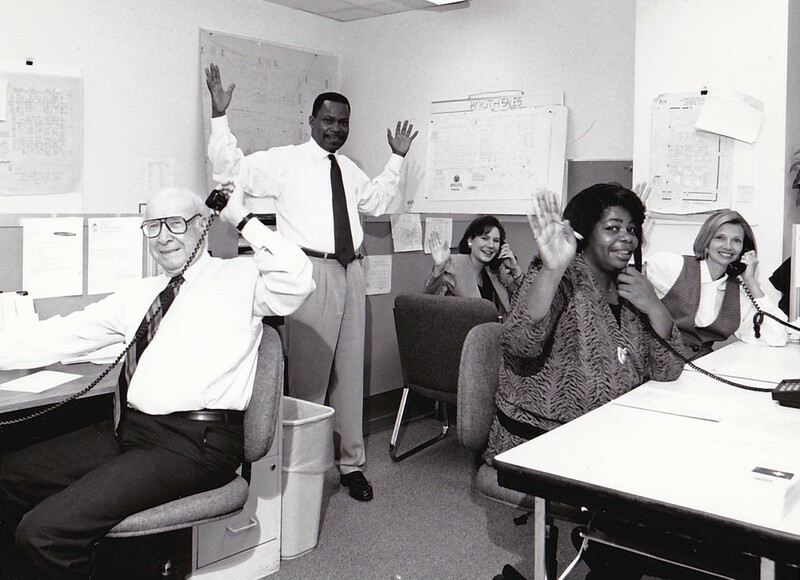 The Corcoran sales team busy selling booths in 1994. Pictured: (L to R) Ward Gill, Cliff Ruffin, Jeanne Corcoran, Debbie Corcoran and Karen Gaines. Corcoran team at the Chicago Small Business Expo, 2000. Corcoran IAEE Wiffle Ball team, 2011. Tom and Debbie Corcoran, 2014. With the NBWA team in Las Vegas, 2013. Corcoran team at the Chicago Golf Show, 2014. Corcoran team outside the Charlotte Convention Center in North Carolina following a fire drill during the ICMA Annual Conference, 2014. Tom and Teddy Roosevelt at the ICMA Annual Conference, 2014. Sometimes, you meet some interesting characters on the show floor. Onsite at the 2015 Annual Vascular Meeting! Pictured (L to R): Dan Corcoran, Debbie Walletin (Society for Vascular Surgery) and our Corcoran Summer 2015 interns Diego and Kiana. For more on our 25th anniversary, read or download the latest issue of our newsletter The Corcoran Report here.